From metallic sneakers to surf-ready sandals spotted on the streets — Spring 2015 is all about understated updates. So when my fab fellow fashion blogger Marissa of the San Francisco-based blog Makin' it with Marissa and I decided to put together a pair of posts featuring our favourite closet staple that has been re-imagined for spring, we both quickly agreed on the classic white button-up. 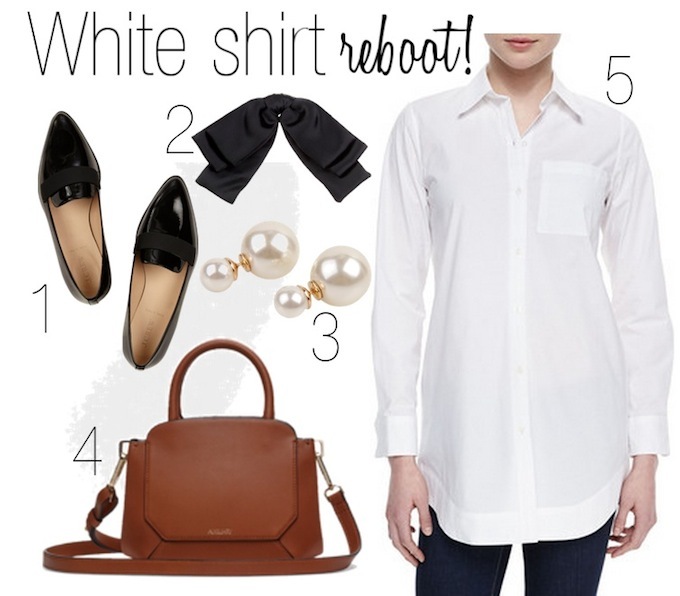 If there's one workhorse in virtually every woman's wardrobe, it's a chic and simple oxford shirt. And this season, the tried-and-true top has been remixed in updates that are making this timeless piece anything but ordinary. So what's my favourite take on the trend? I'm head over heels for either a cropped, short-sleeved iteration — or the borrowed-from-the-boys, tunic shape, as seen above. I love this cut of boyfriend blouse with a pair of skinny jeans or trim ankle trousers and oxfords like these ones from J.Crew. Whether left slightly undone or buttoned up with a sleek silk bow from Saint Laurent (in love!! ), a structured bag such as this Auxiliary by Aritzia Bega Satchel is a must. Finally, I would touch off this classically stylish set with a pair of faux pearl earrings inspired by Dior (but oh-so affordable at less than $20!) by Tresor Creations. There you have it, my top take on the white-hot oxford update! You don't want to miss what Marissa put together, so head on over to her blog to take a look!